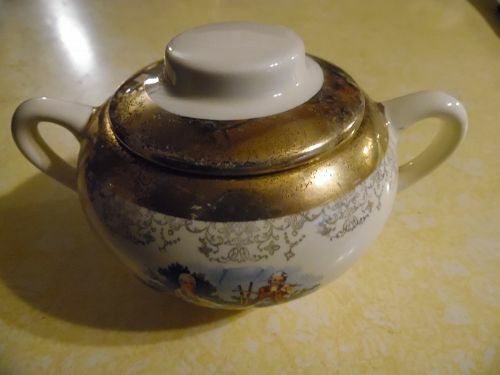 Sabin Warrented 22kt gold trim Crest O Gold replacemet lid for the type B sugar bowl and has the loop handle. 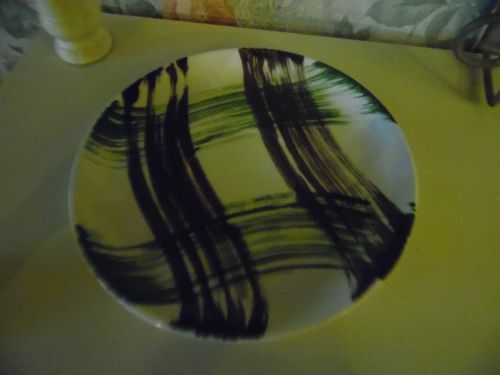 The dishes it goes with has theh Colonial people center design and filigree border. Made from 1929 through the 30's. Nice outer condition with a few small chips inside the rim of the lid, and gold is nice. I will be listing other pieces from this set, so check them out. I do combine shipping to save you $. Beautiful Sabin Warrented 22kt gold trim Crest O Gold sugar bowl with lid with Colonial people center design and filigree border. Made from 1929 through the 30's. 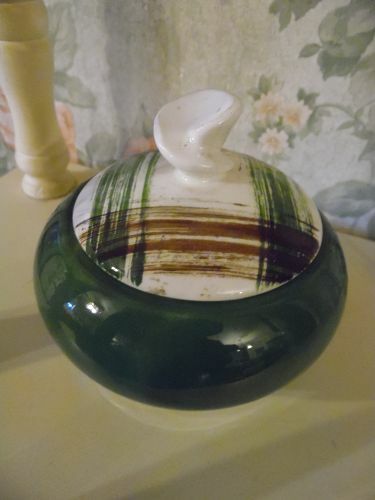 This is the type A sugar bowl that is more desireable and harder to find. 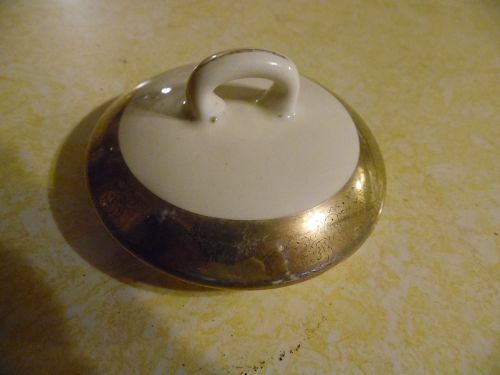 Nice condition with no damages, and gold is 95% with a little edge wear where the lid meets and on the handles. I will be listing other pieces from this set, so check them out. I do combine shipping to save you $. 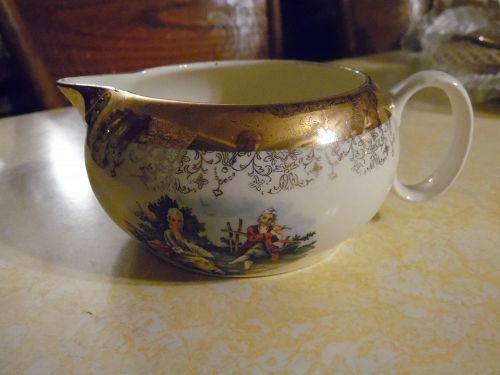 Beautiful Sabin Warrented 22kt gold trim Crest O Gold creamer with Colonial people center design and filigree border. Made from 1929 through the 30's. Excellent condition with no damages, and gold is bright and shiny except in one small spot on the gold. I will be listing other pieces from this set, so check them out. I do combine shipping to save you $. 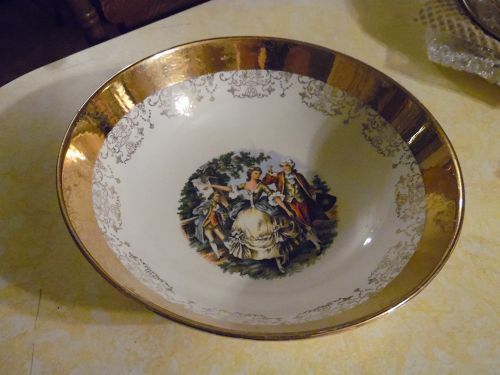 Beautiful Sabin Warrented 22kt gold trim Crest O Gold oval vegetable serving bowl with Colonial people center design and filigree border. Made from 1929 through the 30's. Excellent condition with no damages, and gold is bright and shiny.Measures 7" x 9 1/2". I will be listing other pieces from this set, so check them out. I do combine shipping to save you $. 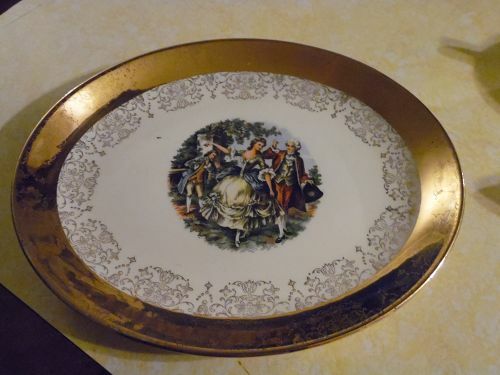 Beautiful Sabin Warrented 22kt gold trim Crest O Gold oval serving platter with Colonial people center design and filigree border. Made from 1929 through the 30's. Excellent condition with no damages, and gold is bright and shiny.There is a tiny speck on the upper left that looks like a factory flaw. Maye you can see it in the photo. I will be listing other pieces from this set, so check them out. I do combine shipping to save you $. 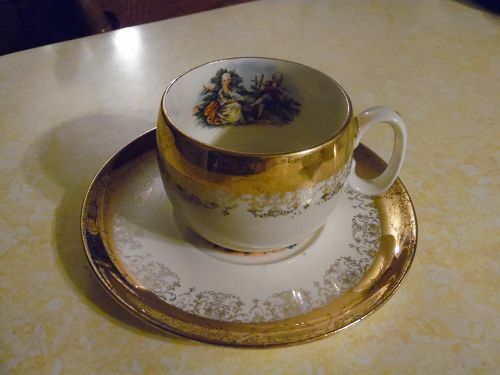 Beautiful Sabin Warrented 22kt gold trim Crest O Gold round cup and saucer, with Colonial people center design and filigree border. Made from 1929 through the 30's. This is the cup that has the round shape cup, and a deep well in the saucer. Excellent condition with no damages, and gold is bright and shiny. I have 6 sets available, and price is for 1 cup with it's matching saucer. I will be listing other pieces from this set, so check them out. I do combine shipping to save you $. 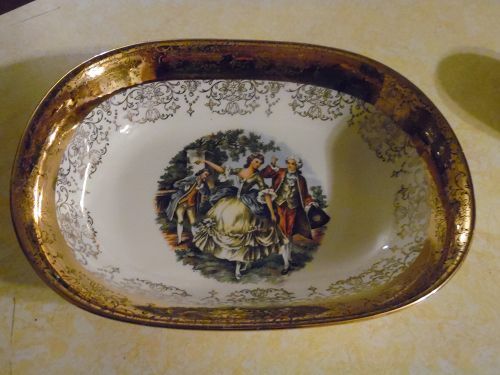 Beautiful Sabin Warrented 22kt gold trim Crest O Gold fruit, sauce, or dessert bowl with Colonial people center design and filigree border. Made from 1929 through the 30's. This is the small bowl measuring 5 1/2" diameter. Excellent condition with no damages, and gold is bright and shiny. I have 6 available, and price is per bowl. I will be listing other pieces from this set, so check them out. I do combine shipping to save you $. 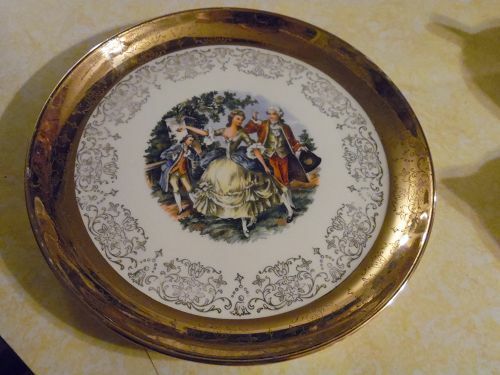 Beautiful Sabin Warrented 22kt gold trim Crest O Gold luncheon plate with Colonial people center design and filigree border. Made from 1929 through the 30's. 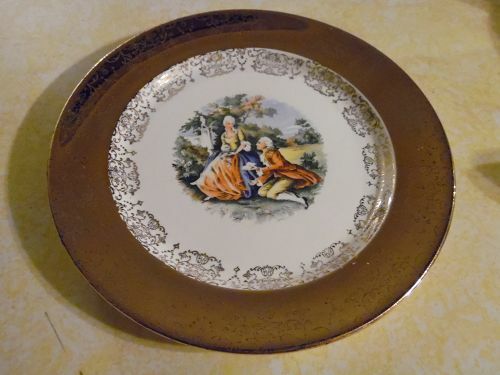 This is the luncheon plate measuring 9 1/4" (even though they were used as dinner plates by this lady). Excellent condition with no damages, and gold is bright and shiny. I have 6 available, and price is per plate. I will be listing other pieces from this set, so check them out. I do combine shipping to save you $. 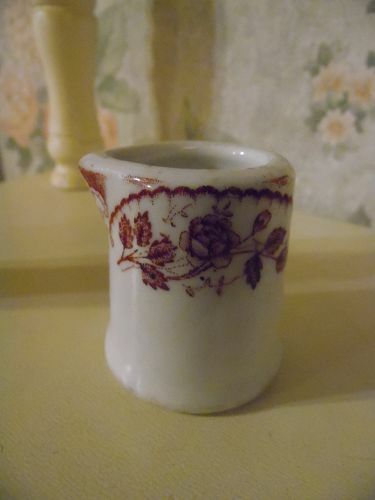 1930'sturdy restaurantware individual creamer, by McNicol China, rosy red on white. Pattern is called both MONTGOMERY and ROSE GARDEN PRINT, in the red version. McNicol China of Clarksburg, West Virginia made this pattern for the Atlanta and West Point Railroad (A&WP) circa 1949. This same design was done in blue. -no issues. Only minor signs of use and minor wear at rims. 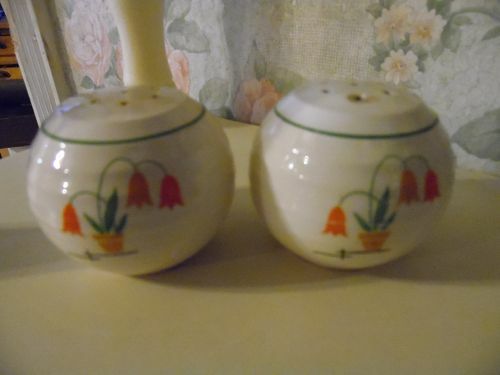 1930'-1960's, Date code shows a P.
Posey Shop pattern, green band, one stopper missing.Vintage round shakers with ridges and thin green band trim. Flower pot with posy's pattern. Small discolored nick at one of the holes, and a little discoloring at he other holes. Very old set, early 1940's. Measures 2 1/4" tall. 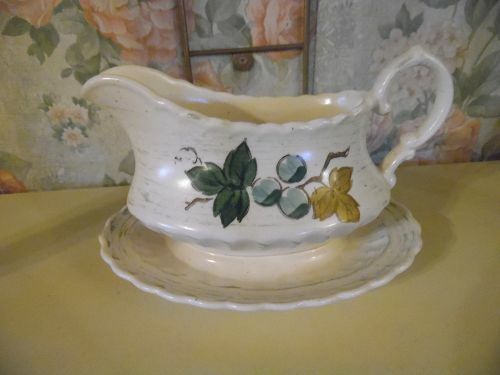 Nice gravy boat with the attached underplate in the Vineyard pattern. Stamped Poppytrail Metlox Made in California. Perfect condition with no damages. I have LOTS of pieces in this pattern, so feel free to check my catalog. Vintage Stetson Scots Clan brown and green plaid pattern china by Stetson. 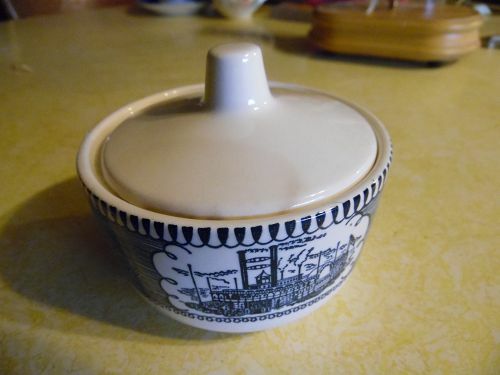 Vintage pattern is sweet.This is the covered sugar bowl and it is perfect. I have other items in this pattern. Vintage brown and green plaid pattern china by Stetson. Vintage pattern is sweet. These are the 6 1/4" diameter saucers. I have 4 available and all are perfect. Price is for each saucer. I have other items in this pattern. 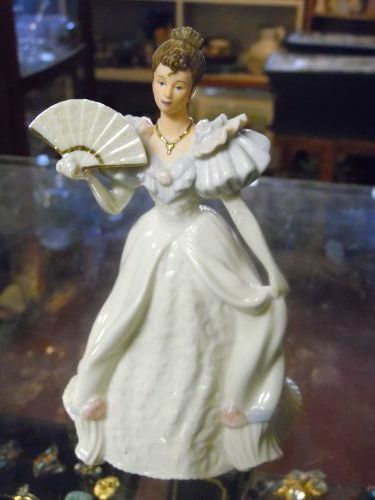 Lenox China Collection BEAUTY OF THE BALL figurine This is the BEAUTY OF THE BALL figurine, part of the series of figurines made by Lenox 2003. No original box. This figurine is in perfect condition with no signs of wear, chips, or cracks. 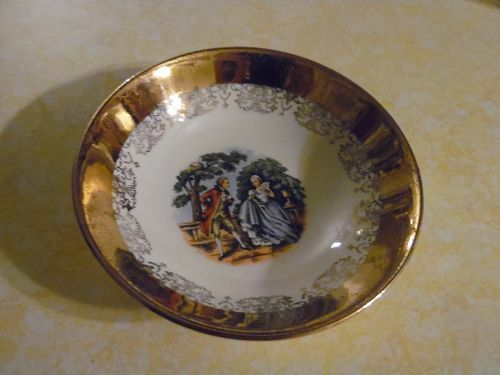 Crafted of ivory fine china decorated with 24K gold accents. Approx 6.5 inches tall. Very detailed. 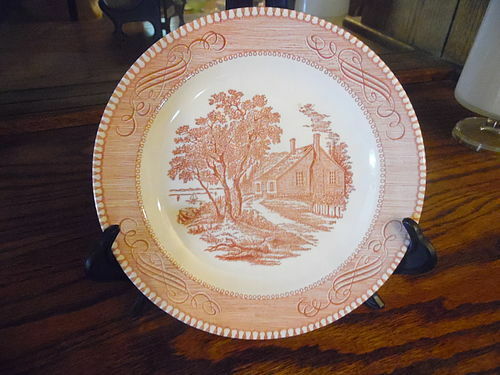 Currier and Ives “Washington birthplace" 7.25" Pink, (some refer to it as red) Ironstone Salad Plate Royal China Co. USA. Harder to find Royal China Co Pink Great Condition. No cracks, chips, or stains. Dishwasher, detergent, and oven proof. All decoration under glaze. I have 4 available. Price is for each. I do combine shipping if interested in multiple pieces. Please include zip code when inquiring.